There have been some times in my life when I've been so busy that the last thing I want to worry about is my hair. Sometimes you just don't have time to wash your hair between the gym, school and/or work, and a full social calendar. 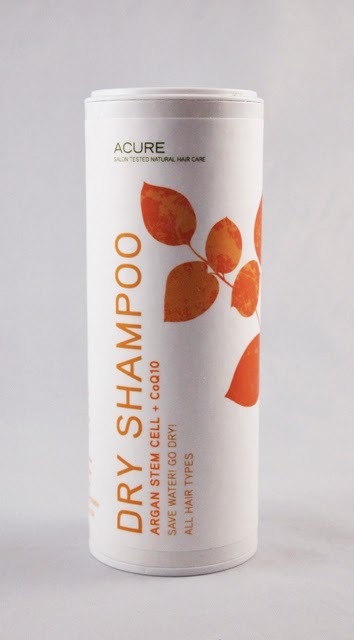 Fortunately, dry shampoo can help you squeeze another day or two out of a great blowout or even a regular wash. Acure Organics makes a dry shampoo with Argan Stem Cells and CoQ10. This dry shampoo comes in a handy shaker bottle with three different dispenser options on a swivel top. I tend to use the shaker option, but you could use the others if you're in a hurry. The dry shampoo has a white, powdery consistency and blends easily into hair, regardless of color. It helps absorb oils and keeps your hair looking fresh. I love how it contains organic (non-GMO) corn starch and other gentle ingredients that give it the lowest rating, a 0, on EWG's Skin Deep database. It is also vegan and gluten-free, another big plus. If you're looking for a dry shampoo, this is a great option.